American expats in Britain are choosing their president. Can they help but be influenced by widespread anti-Bush feeling in Europe? When the US goes to the polls on 2 November, tens of thousands of votes cast in Britain will help decide who will be sitting in the Oval Office for the next four years. Looking back across the Atlantic, the UK's 250,000 American expats will see a tight contest, with little to separate Republican incumbent George W Bush and Democrat challenger John Kerry. The parties are rallying their British-based supporters, telling them that their ballot could make the difference - think Florida, where a mere 537 votes controversially handed the Presidency to Mr Bush in 2000. But the voters they are speaking to are not quite the same as those back home. These are people who are exposed to a society with subtly different values and a media more frequently opposed to Bush's leadership. Just how strong is the influence of British life on the way the expats vote, and what is it like to watch the vote from afar? Whatever their differences, the Republican and Democrat campaign teams are agreed on one thing - the British media. "The press is definitely more pro-Kerry than pro-Bush," says Sharon Manitta of Democrats Abroad UK. "We get to see more news stories that have a definite slant than the right wing, sadly, mainstream media in America." It's not just that President Bush is frequently portrayed as a figure of fun that is important to the two camps, but that they also see the UK media as being more likely to be critical of the Iraq War. Such sentiments have spilled over into day to day life, says Professor Colleen Graffy, chair of Republicans Abroad UK. "There's a European group-think that's going on about George Bush and it's beginning to get beyond reason at this time," she says. "Many people are pro-Bush but feel they can't say so in public." Should further evidence of the UK's apparent leanings be required, there is also a recent poll which suggested that were it down to them, half of all Britons would vote Kerry, compared to 22% who would go for Bush. Things are far less straightforward when it comes to the US expat community though, and with so much at stake it is this which is driving the parties to pull out all the stops. Although a recent survey by pollsters Zogby suggested Americans with passports supported Kerry over Bush by 58% to 35%, even the Democrats do not argue that this figure translates to those who have made their homes in the UK. Each party likes to think it has slightly more voters than the other, neither able to be certain because votes cast by US expats are not totted up in a way which they can rely on. It is generally accepted, though, that members of the US military are more both more likely to turn out and to vote Republican. But the Americans working in Britain in banks, law firms, schools and the likes are less easily categorised and a rough 50-50 split is seen as closer to the mark. The result has been a frantic few months for both sides. 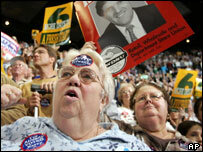 For its part, Republicans Abroad UK had a visit from the President's aunt, Laura Bush Ellis, to rally voters. Like the Democrats, it has been arguing that it is the party with the best domestic policy and the ability to keep America safe in a dangerous world. Many expats in the UK come from the swing states of Pennsylvania and Florida - which could hold the key to the White House - and are simply too important to ignore, says Professor Graffy. Back in the Democrat camp, Ms Manitta is similarly upbeat: "We have had to do very little encouragement because people are so fired up about this election that they're coming to us in droves." Just as the election is too close to call in the US, so too it is in the UK. What do expats themselves say? "I'm glad I'm not being inundated with all the ad campaigns, the rhetoric and the lies," says Heidi of watching the election from the UK. "My American colleagues and I are not really discussing the election very much. "Voting by absentee ballot isn't as big of a deal. If I'd been back home I would have proudly worn my 'I voted' sticker after going to the polls. "Things happened here without much fanfare." But this is not to say that the outcome of the poll is not important to Ms Sokol, a London-based banker who has returned her postal ballot. "I'm hoping that Kerry can make a difference," she says, her Democratic leanings hardened by the war in Iraq. "When American politics or the election comes up for discussion, I try not to get defensive about it," she says of life in the UK. "During my time here I have had my eyes opened," says Thomas, a former Republican lobbyist and now a colleague of Heidi's. "I'm not one of these Americans who just picks up USA Today, I pick up the FT, I watch the television." Criticism of the Iraq War and President Bush has not stopped him from voting Republican. Bush has a better handle on domestic policies, he says, and having been in New York on 11 September, he believes the President is the man to protect the US. "I think a lot of it is pointing the finger at the guy in power," he says of criticism in the British media. "But he's an easy target and there are times I cringe when he opens his mouth. "I consider London my home, however just this week I began getting asked about who I'm voting for and I have said: 'I choose to keep that to myself'." "My impression of Bush has been helped by the fact I do live away from the country, because over there you're inundated, particularly over 11 September," says Jerri, a teacher. "From here you can look at it with perspective." After five years in the UK, Jerri is still very much influenced by domestic politics and says President Bush's tax policy has hit the poor. She says he also mishandled Iraq and knows of other expats who have felt under fire simply for being American. "I don't feel that there's any bad feeling towards me, but I do know a lot of people who feel that way." "I have voted for a green candidate," says Andrew, from California. "If you had asked me 10 years ago I would have said I was Republican, now it's more dependent on the candidate. This year there's nothing compelling about either of the main candidates, so I looked outside the usual gang of guys." Like several of the expats, Andrew says his time in Europe has made him think more about foreign policy. He is not convinced that the British press is anti-Bush: "Europeans are very anti-Republican in my experience, but I would not say that's so much the case here." Hamilton Shields, of New England. Democrat, 61. "I would certainly not have voted Republican even if I had remained in the States," says Hamilton, a UK resident for 30 years. "I also like to believe that through rational analysis I would have arrived at the same position I have on Iraq and other issues. "However, I have no doubt that one of the reasons I have been on a low boil over the last couple of years is that the media here does cover Iraq in more depth, perhaps with a little more bias." "I would not say it would be fun to be (in the US for the election) because the level of hate in certain parts of America, particularly if you are a Democrat in fairly staunch Christian locations can be fairly severe. "But you don't get the same level of excitement over here." Most Americans in Britain chose to leave the US, Hamilton adds. "I have to say that among all the Americans I have met over here, I have met only one or two Republicans." "As a general rule the media on both sides of the planet could use more balance," says Tom, a Cambridge lecturer in the UK for nine years. "Even in the US it's lopsided, but over here the media often seems one sided." The tide of feeling against President Bush is clear in society as a whole, he says: "You really know, even if you never read a poll or the papers that there's a popular predisposition towards Kerry." Not one to be swayed by popular opinion, Tom says he is not someone to avoid revealing his Republican credentials if asked. "I read reports from Americans overseas who believe that Europeans and Britons react in an extreme way when they learn you're a Republican. "I have not encountered that, at most I have seen surprise. The typical response would be 'oh my'." The one way in which life in the UK has swayed him is on foreign policy: "I have seen there's a need for a President to interact with our allies." Add your comments on this story, using the form below, especially if you are an American living in Europe. I'm an American expat who's just voted for George Bush. I think one thing that my American colleagues are afraid to point out is that we are (at least I am) continually chastised about Amerian policies, and often ridiculed for American actions (on all fronts). Being in Britain has made me an even more staunch Republican, because from here it is easy to note how hypocritical the Democratic party, and liberal leanings in Europe really are. I am a 20-year-old from Ohio studying abroad in Sweden for one year... I have been informed on numerous occasions that it's suprising that I'm 'a smart American,' as if that phrase is an oxymoron... This is my first presidential election and I'm proud that my vote matters quite a bit. I find it fascinating to read how many people living abroad find our media right-wing, as the commonly accepted view of the American media held by conservatives and liberals alike over here is that is it liberal as liberal can be. I am from Ohio, one of the most fiercely contested states. I like Edwards, but let's go with Kerry, and damn it we need a President with a brain, able to think and rationalise, communicate with voters. Let's not let the Supreme Court or heavily dominated Republican Congress decided on Bush again. By all means give him a padded room in the White House, but not the Oval Office. If one wants to avoid the media onslaught or engage in responsible, "balanced" debate it is not necessary to leave the country. Stop watching your television. Read more and from more varied sources. Seek out like-minded fellow citizens. Discuss, debate and respect. Set an example this way. I am a 29-year old Republican, a gay one at that, and have been living in London for over four years now. I'm very excited to be voting this year. And yet again, my vote won't really have a major effect (as Kerry will win California easily), but it's still my duty as a citizen. As others have written, it's very different not having the constant onslaught of media coverage. Luckily, on Sky, Fox News's US feed is shown live. I get a different perspective, as opposed to what one gets from The Independent or The Guardian. I am an American who has lived in London for more than a decade. It is with sadness that I watch our great country get washed away by the radical, extremist actions of the minority. We make a mockery of democracy - lost ballots, votes not counted, election fraud, intimidation, civil liberties hammered on a daily basis... I have not yet given up hope that the majority of my compatriots will see this administration for what it is and cast their votes for John Kerry so that we have a lawfully elected President in office once again. So expat Americans have noticed media bias. I wonder who they could mean! Two Republicans highlighted in the article against three Democrats? There's balanced reporting for you. It has been nice not to be in the US while the campaings have been running. My family in Nevada, a "Battle Ground" state, have said it is really bad with all the ads on the television. My biggest fear is that who ever wins, the country is still going to be divided. I've lived in London 18 years, but am originally from Chicago. I find I can't even discuss politics with my ultra-conservative family in the states. I fell out completely with my brother, an ex-marine, over the Iraq war. I think many people in the US swallow whole the propaganda of the predominantly right-wing media. The US is such an insular place, many people seem incapable or unwilling to try to understand the world beyond their borders. By contrast, Brits tend to view the world with a healthy dose of cynicism and a far greater respect for other peoples and cultures.